Human sweat does not actually smell. In fact, what makes the sweat give off a bad odor is the bacteria that ferments in it. Bacteria loves thriving in hot, humid environments. Thus, a deodorant is used as it has an antibacterial effect that kills some of the bacteria to prevent them from multiplying and it eliminates body odor. Biocides contained in deodorant ingredients are responsible for killing skin bacteria to stop body odor and fragrance masks the odor. An antiperspirant, on the other hand, reduces the amount of available water on the skin with astringents, most commonly aluminum salts. A deodorant and an antiperspirant is generally an emulsion of water in oil or water in silicone. It further contains active ingredients such as biocides or aluminum salts, emulsifiers, gelling, suspending or thickening agents, waxes, emollients, preservatives, colorants and fragrance. The raw materials are charged in a jacketed stainless steel kettle. The oil phase, which is combined first, is composed of solvents such as the alcohol, propylene glycol, and glycerine and silicones such as dimethicone. Next, the flaky or powdery ingredients such as the cetyl alcohol is fed into the preliminary oil phase. The active ingredient is dispersed into this phase. Steam heat is applied to melt the ingredients while the batch is being mixed. During the blending process, the temperature must be carefully controlled to avoid burning the viscous waxy ingredients. Bentonite (suspending ingredient) is added. 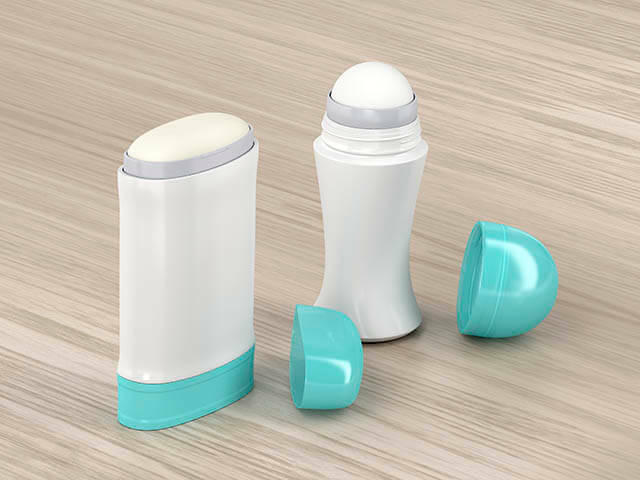 The product is ready to be cooled and poured into moulds to form deodorant sticks. Agglomerate-formation is frequent due to waxy ingredients. Intense shearing is required to develop desired properties. When temperature is not regulated properly, some gels may be prone to degradation. Solvents are first introduced into the mixer. Upon starting the mixer the solid/powdered ingredients are added. The mixer induces powerful shear between the ingredients as they move around at various speeds. The high shear mixing action of the workhead forms a uniform and stable emulsion. Ginhong Deodorant Mixer is capable of attaining uniform and homogeneous emulsion, with good physical and chemical properties. An Inline Shear Mixer runs in a continuous manner and is a more compact configuration than the Batch High Shear Mixer, it is more suitable and recommended for manufacturing plants with limited space.